Before you make that seed order this year, pull out all of your seed packages from last year. 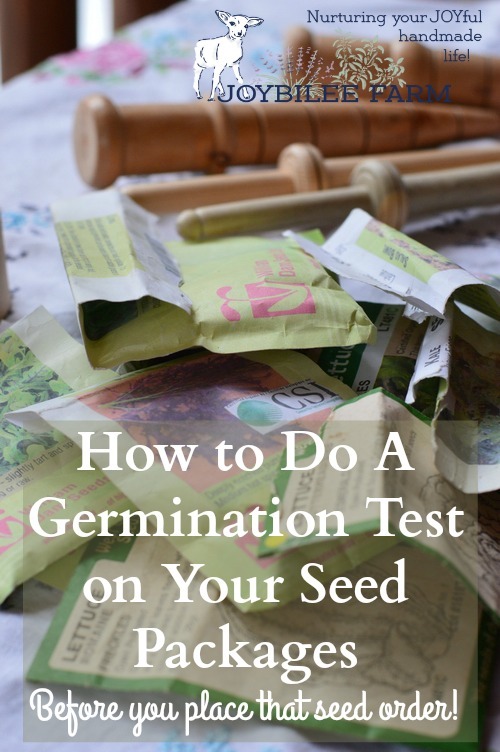 Do a germination test to see if your seed is viable. Your seed has a shelf life. Average shelf life though can vary significantly. For instance, corn has a shelf life of 1 year according to expert opinion. However, I’ve done germination tests on 10-year-old corn seed and found that it was still viable, at a 90% germination rate. You don’t know until you’ve done your own germination test of the seed you have whether you need to replace it with fresh or whether you’ll get another growing season from it. Face it. Gardening can be expensive. It’s not “free food”. There are costs involved. But growing your own food in your back yard doesn’t have to cost more than buying the same food in the grocery store. There are ways to save money gardening. One way is to only buy the seed you need. Unfortunately, sometimes you don’t know it’s time to buy more seed until you’ve already had a germination failure. And by then it may be too late to get fresh seed and start again. Especially if you garden in zone 3 with its short season. Many gardeners go ahead and buy fresh seed every year to ensure against germination failure. (I’ve done this, too.) But this can be expensive. Some hybrid seed can cost more than a dollar a seed. Doing a germination test on the seed you already have, is a good way to avoid buying seed you don’t need. 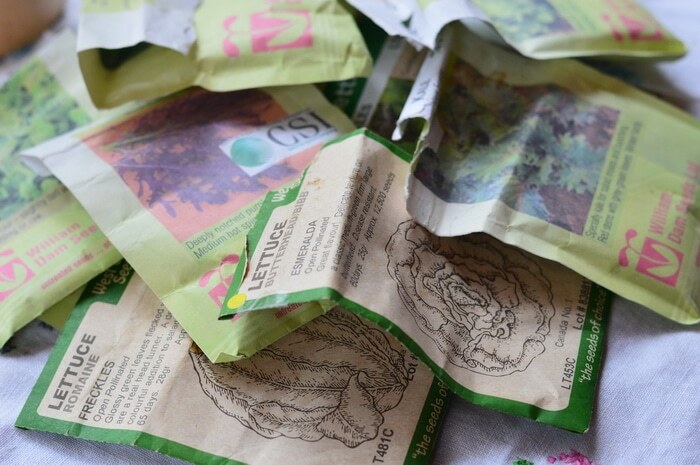 Before you make that seed order this year, pull out all of your seed packages from last year. 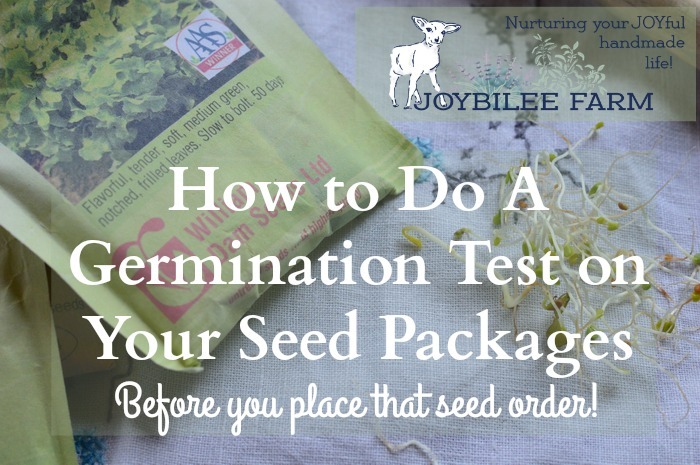 Do a germination test to see if your seed is viable. Your seed has a shelf life. Average shelf life though can vary significantly. For instance, corn has a shelf life of 1 year according to expert opinion. However, I’ve done germination tests on 5-year-old corn seed and found that it was still viable, at a 70% germination rate. You don’t know until you’ve done your own germination test of the seed you have whether you need to replace it with fresh or whether you’ll get another growing season from it. It’s time to make your seed order. I tend to buy larger packages of seed so that I don’t have to buy fresh seed each season. Seed is a living organism. A seed has a shelf life. Most seed will last several years if kept in a cool dry place. See my article about how long different vegetable seeds remain viable for more information. 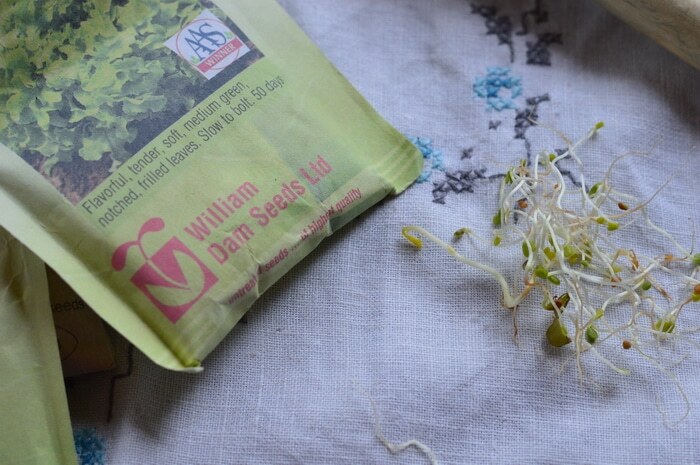 Before ordering this season’s seed I will check the germination of the seeds I still have. There is no point in planting seed that doesn’t have at least a 50% germination rate. If I think a seed package is less than 50% I will throw it out on the fertile ground outside the chicken yard and let it feed the chickens, with the sprouts. With my short growing season — less than 45 days frost free, maybe, if I’m lucky, I don’t want to risk having to replant, so I need to be sure my seed is viable the first planting. 1. Take a paper towel. Label the paper towel with permanent ink with the name and variety of the seed that you are going to test. Add the date. Let the ink dry before proceeding. 2. Dampen the paper towel with a mixture of filtered water and hydrogen peroxide (1 tbsp. hydrogen peroxide per 8 oz. of water). This inhibits mold and fungal spores. Wring the paper towel out so that it is just moist but not dripping wet. Fold it in half. 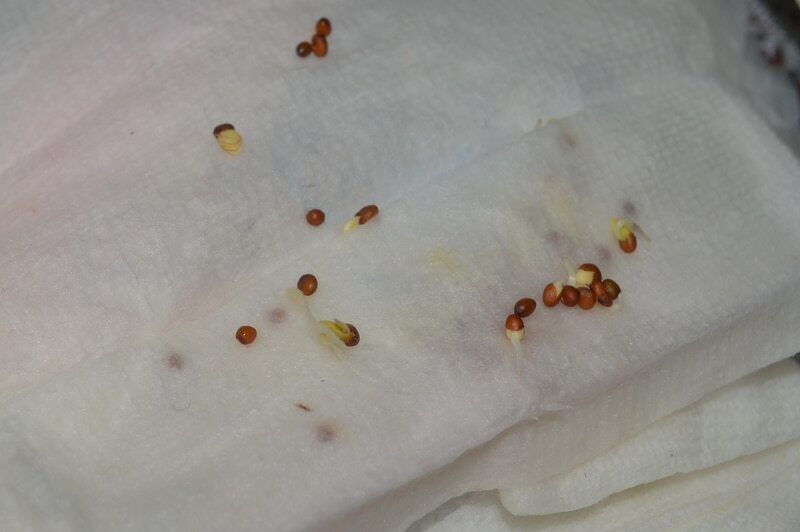 Place 10 seeds on half the paper towel. Fold it over. Place the paper towel inside a sandwich bag or glass jar. Place in a warm area, out of the way. I place mine on top of the fridge. 3. Check back in a week to 10 days. If there is little germination, wait another week. After 15 days on most plants you should have sprouted seed. A few might require 21 days. Keep the bag sealed so that you don’t have to add more water. 4. Count the number of seeds that germinated out of 10. Add a zero and you have the percentage of germination. If you get 50% or higher, you can safely use the seed another season. Less than 50% and you might get away with it by planting more thickly or by starting seeds in pots and transplanting out. Less than 30% and you will want to buy fresh seed this year. Some plants like onions and corn have a very short shelf life. I have had corn seed with 70% germination after 5 years, though, so it’s important to check the germination rate before you discard older seed. And also, once you have determined that seed is no longer viable, please discard it, so that you don’t need to test it again. Testing seed germination rate before you order your seeds ensures that you only buy the seed you really need. It also saves you grief during the growing season because you’ve culled out the seed that won’t do well, allowing you to optimize your garden space. Take the time now to check germination and save time and money on your gardening this year. Once you’ve tested the germination you may want to plant the germinated seed into starter pots and keep them growing. Just put them in a pot as you would un-germinated seed but handle gently so that you don’t separate the root and the tip from the food source. Or not. The choice is yours. 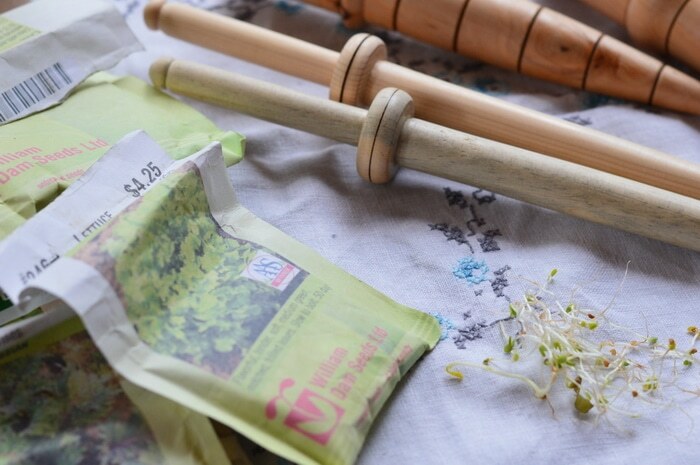 Bonus tip: Store seed in envelopes, in dry glass jars, to which you have added a few tbsp. of dry clay kitty litter. This will keep excess moisture from building up inside the jars, in your cool storage area, and let your seeds last longer. I created a set of worksheets to help you keep track of your germination tests and your seed catalog orders. You can download these and print out as many pages as you need. Grab it here. An old post I saw said that you sell French Woad leaves. I am interested but cannot find anything an your current site. Can you help? We’ve never sold woad leaves. They must be used fresh to be effective for natural dyes. Richter’s herbs used to sell woad seed. Hopping by and following your lovely blog (twitter and FB). I blog at http://olahmomma.com/blog. I am also inviting you to add your blog at our community website by clicking this link: http://olahmomma.com/momlounge/node/add/blog-list (if you are already a member, please ignore this invite). Thanks. Wish you a great day! Thanks for stopping by and leaving a comment. I hopped over to your blog and also added Joybilee Farm to your community. Thanks for inviting me.